I found a few recipes recently that call for lilacs. Who knew lilacs were edible? I certainly didn’t. And what great timing to discover these culinary uses the same week mine bloomed! 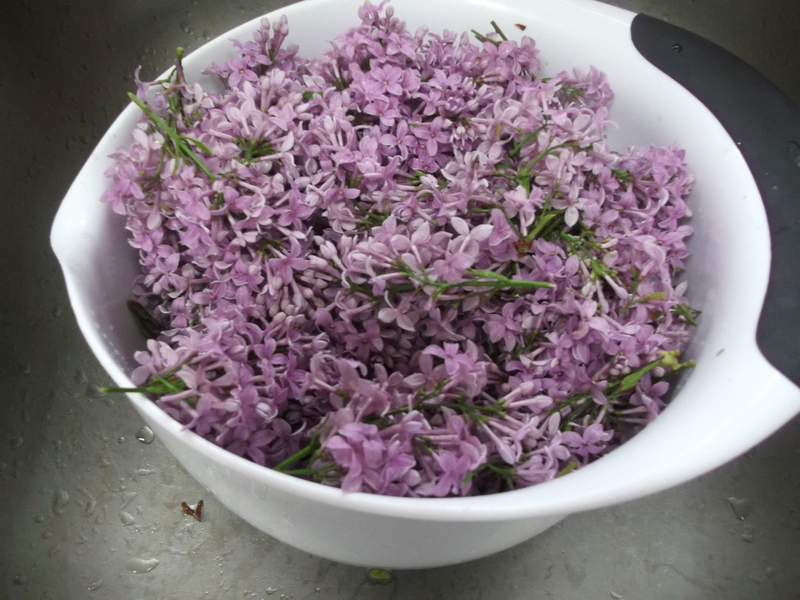 To prepare lilacs for recipes, first you need to go pick a whole bunch of them. Get them from a trusted source, where you are sure they haven’t been sprayed with pesticides or other chemicals. Pick some extra to put in a vase in the house. NOTE: If you wait a few days after the lilacs have bloomed and collect them just as the blossoms are starting to fall off the bush, this task is immensely easier! The blossoms will literally fall off the stems into the bowl with either a good shake or a very gentle tug. To begin, pull the lilacs apart into tiny clumps. This first step is optional but I find it’s easier to remove the blossoms from these smaller clumps than from the larger branches. Get a bowl for “discards” and another bowl for the picked blossoms and buds. 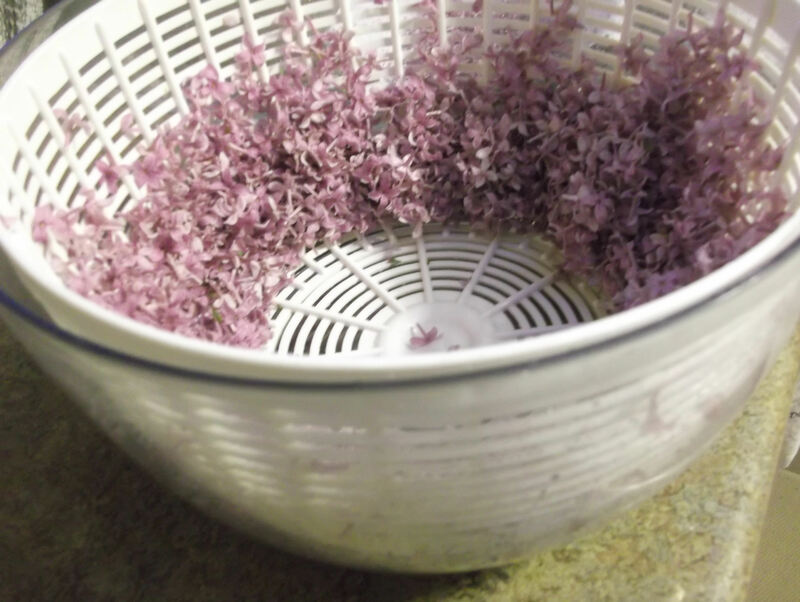 If you place the blossoms into a salad spinner, it will make for easy rinsing later. Now begins the fun! Gently pick all the petals and buds off of the small clumps. Make sure no green leaves or stems are left on the petals (e.g., the one on the right). 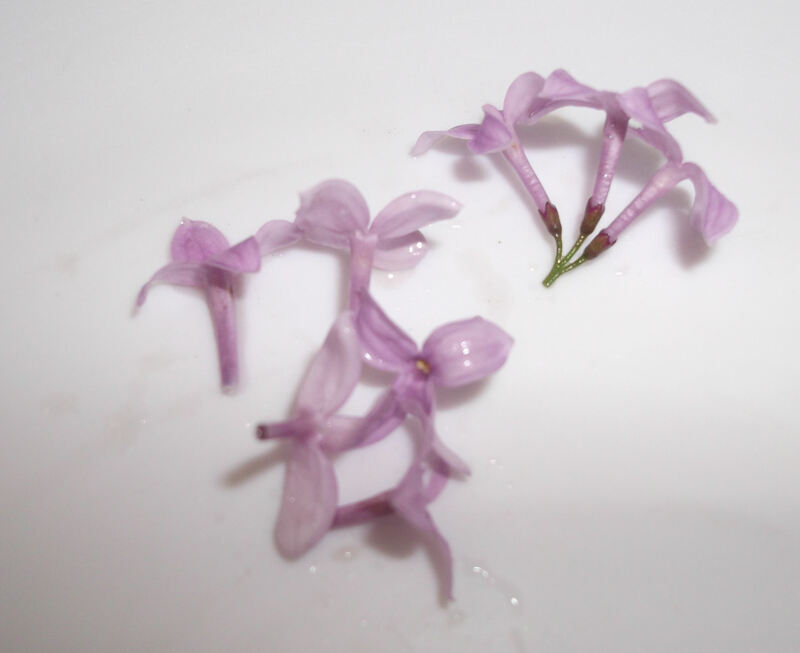 Note: if you’re using the lilacs for syrup or jelly, it’s okay to leave a little bit of stem attached since you will be straining everything out anyway. But don’t leave too much or it could affect the flavor. Keep on plucking the blossoms. Yes, it’s a slow process, but it’s kind of a great no-brainer, meditative process. Crank up some of your favorite music, listen to podcasts or watch TV. I love to do this on my deck listening to nothing but nature and the occasional barking neighborhood dog. Keep plucking. You’re getting there. The bowl will eventually fill up, but it does take some time. Now that you’ve picked them all, it’s time to give them a good rinse or two. Add water to the bowl (or salad spinner) full of blossoms and swish them around a bit. The unwanted bits conveniently sink to the bottom of the bowl while the blossoms float on top. How cool is that? Remove the floating blossoms by hand and set them aside. 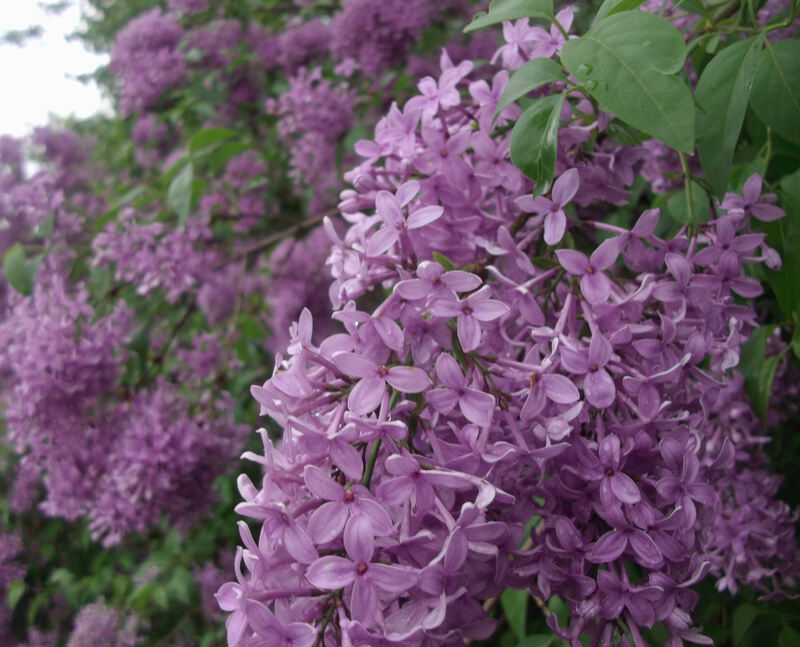 Dump out the water (or use it to water your lilacs!) and give the blossoms another good rinse if you think they need it. Now, dry the rinsed blossoms really well. I use my salad spinner to dry them in small batches, and it works great. Empty the dried petals onto a clean dishcloth and allow them to completely dry, blotting very gently if needed. If you’re not quite ready to use them yet, place the dried blossoms into a resealable plastic bag and store in the refrigerator. They should keep for a week or even longer. Interesting! Had no idea these were edible. We just have a tiny lilac bush; I’ll have to remember this for next year and go and raid my parents’ mega bushes! Great tips & recipes!